Before we generate a list, it is necessary to define first those outputs or variables we are interested in at the tab window ‘Parameter list’. As shown in the picture, by doing a right mouse-click on the tab window ‘Parameter list’, a context menu will enable us to add the columns corresponding to the outputs or results we are interested in. The rows will contain the variable values according to the bounds and number of steps. 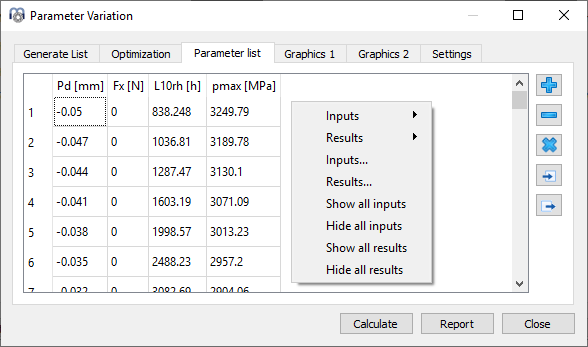 By clicking on ‘Calculate’ while the “Generate list” tab window is active, a list of all parameter combinations will be generated at the corresponding tab window ‘Parameter list’ and the analysis will be run. Depending on the chosen number of parameters and steps, the analysis can lead to long calculation times. A second way to create a table (parameter list) is possible by adding rows and entering values manually with the -button. Moreover, a whole table can be imported from a CSV- or XLS-file using the -button or exported into a file using the -button. Then, in order to run the analysis, we just have to click on “Calculate” while this page is active. Please note that the parameter list is not saved if the dialog is closed.